The Yarra River near Odyssey House. This scenic ride takes you down the Diamond Creek and then follows the Yarra River to Heidelberg. The section along the Yarra River is particularly beautiful. Eltham, once a bush haven for artists has now been caught up in the urban sprawl. Even so, this ride is mainly through bushland and parks. If you are not pushed for time, it is worth stopping at Edendale Community Environment Farm. The section of the Yarra around Heidelberg was inspiration for many of the artists of the “Heidelberg School”. Heide, now an art gallery across the river from Heidelberg, was also the gathering place of many modernist artists. Cafes and toilets are in short supply along this ride. There are cafes and a toilet at the start of the ride in Main Hurstbridge Rd. There is a cafe and toilets at Edendale Community Environment Farm. There is a sign and entrance off the path. When you get to Eltham you could divert to the main street for coffee. There are no cafes on the trail between Eltham and Heidelberg. There are picnic tables and toilets in Westerfolds Park. There are toilets near the end of the route just off the trail. There are cafes in Burgundy St Heidelberg although you will need to walk toward the station to find them. The trail is mainly paved with a few short sections of gravel. There are a few short hills on the Yarra River section. Canoeing is popular on the Yarra. Start on the north of Diamond Creek Station on the corner of Station and Gipson Streets. Ride along Gipson Street and turn left into Elizabeth Street. Ride along Elizabeth Street and cross Main Hurstbridge Road at the traffic lights to enter the park on the other side. Turn right to ride on Reserve Circuit. Take the first path on your right that leads to a bridge over Diamond Creek. Cross the creek and turn left (South) onto Diamond Creek Trail. (Turn right here if you want the toilets). Follow Diamond Creek Trail for 2.1 km ignoring all paths on the right. Eventually the trail will turn to the left and reach Allendale Road. Turn left on Allendale Road and cross the creek on the rather narrow bike path and cross the road just before the railway crossing to pick up the trail. Follow the trail for 2.6 km to Wattletree Road. The trail initially follows the railway line before following a number of bends in the creek. It passes Edendale Community Environment Farm and eventually follows Gastons Road. To cross Wattletree Road use the underpass to Railway Parade (a continuation of Gastons Road). Immediately cross Railway Parade to find the shared path on the other side and turn right to follow the railway line. Turn right at Diamond Street and cross the railway line. Follow Diamond Street for 300m until on your left you see an open gate in a high fence leading into Andrew Park. Turn left to enter the park. Briefly follow around the oval towards your right in Andrew Park and then turn right onto a bitumen track. This is the continuation of Diamond Creek Trail from Eltham. Turn left to follow the trail. Make sure you follow the creek and do not turn off. After 1 km, just before Bridge Street you reach your first pedestrian bridge. Turn right and cross the bridge to follow the trail on the other side of the creek. After 1.7 km the trail goes under Main Road and turns right to follow Main Road and then Hohnes Road past a miniature railway. The trail crosses the entrance to Lower Eltham Park. Immediately after this it turns left and leads to a bridge over the Yarra River. 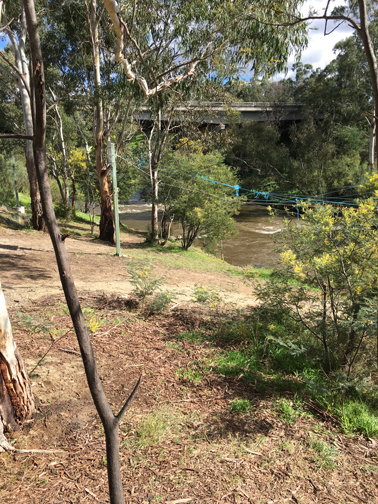 Cross the Yarra and turn right to follow the Main Yarra Trail through Candlebark Park for 850m. At an intersection, it will swing right towards the river. The trail passes under Fitzsimmons Lane to enter Westerfolds Park where it follows a bend in the river for 2.4 km before eventually turning and crossing the river. Do not turn left off the trail in this section. There are plenty of dirt tracks leading down to the river on your right. If you choose to follow these, they will eventually join back to the main trail. The trail turns right and follows the river. It crosses Bonds Road and intersects with the Plenty River Trail after 3.6 km. Continue straight ahead here. For the next kilometre or so there are a few alternative paths but they all join up again, so head west generally. You’ll know that you are on track if you cross Plymouth Street, a cul-de-sac. Continue on the trail until you pass Heidelberg FC (2.4 km after the Plenty River Trail intersection). Immediately after the football ground turn right and then left to exit onto Beverley Road. Follow Beverley Road to the left as it becomes Burgundy Street. Follow Burgundy Street as it crosses Rosanna Road into the main shopping strip for Heidelberg. Either walk your bike or ride up Burgundy Street to find Heidelberg Station by turning left just before the railway line. by starting at Eltham Station. instead of exiting to Burgundy Street and Heidelberg Station, continue on Yarra Trail 2. Montsalvat detour (2.4km return, purple route on Google Map). Montsalvat is an artists colony established in 1934 by Justus Jorgensen. The buildings resemble a medieval castle. After step 16 above, look for Withers Way. Turn left and cross the creek when you get to Withers Way. Ride east along the Wingrove Park track to Dalton Street. Continue up Dalton Street, cross Main Road and ride up Dalton Street. At the intersection of Mount Pleasant Road and Hillcrest Street turn down Hillcrest Street. The entrance to Montsalvat is on the right. The old railway bridge near Eltham. The side trip to Monsalvat is shown in purple.